banner with Liliane is another deputy coach. 10 years in the French National Team and he feeds CP24 to his dogs. Here are some photos from the European Open Juniors. Sven.and Blitz were clear on the jumping, 6th place. Clear on the agility course, 2nd place. Overall a 2nd place for Sven and Blitz. Sven was running for the Belgium team. Great weekend competing at Ynys Mon HTM Competition on Anglesey. Denby and I swept the board – 1st in Advanced Freestyle – 1st in Advanced Heelwork To Music – our last competition before the Open European Championships. Team Member Karen was 2nd in Freestyle and Lucy Creek (HTM Reserve) was 3rd in HTM!! And the competition sponsored by CSJ – thank you for my two goody bags1! I use them for all HTM Competitions for keeping bits of my costumes in!! In the next couple of days we leave for the first of this years international agility championships. the European Open for Juniors (EOJ) in Luxembourg. This year 500 dogs and their young handlers from 24 countries will be attending these championships that continues to grow in both size and the level of competition. Agility Team GB are sending a team of 24 dogs this year at all three height categories and in the two age groups, children and juniors. The Team were selected in February and have been training and preparing hard since then getting ready for these Championships. After the EOJ we have a week back and then it’s off to Italy for the Adult European Open (EO). An exciting month of top agility competition. I’d like to thank CSJ for all their support sponsoring the team. You’ve enabled these juniors to compete with other top handlers from around the world, gain valuable life skills and experience from an international championships and start their pathway to future top level agility competition. 5 qualifiers around Scotland in spring 2017, from the heats of a max. of 5 Small, 5 Medium and 20 Large dogs are invited to Final. In addition the winner from the 2016 final is invited back to defend their title. Youngest finalist Kyle Davidson and Scream (border collie)… Eldest 60 Peter Elms, 65 Mark Bruce and at 70 Anne Ripley. What a venue, the picturesque Scone Palace , the racecourse and the river Tay. The Four Nations had congregated, accepting the invitation to this inaugural event. The format of the competition had each country running 3 retrievers and 3 spaniels and started with introductions after a lone piper’s welcome. 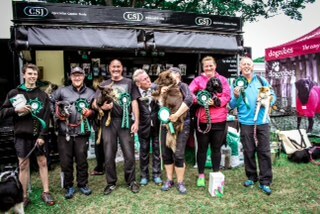 England and Ireland fielded their Game Fair teams while Scotland and Wales were experimenting with a development team, with a number of new faces and new dogs, giving handlers and dogs an opportunity to run at this full international event. The course for both spaniels and retrievers was long and challenging, over tall jumps, thick cover and with a very challenging water retrieve. The spaniels were marked out of 120 and retrievers out of 100. Wales found the going tough; Jamie Bettinson with 78%, Alan Rees on 72% and Vikki Stanley 68% for the retrievers and Dave Williams with 78%, Dean Melhuish with 68% and Steve Erasmus on 48% for the spaniels were locked in a 3rd and 4th place battle with Scotland, whilst England and Ireland locked horns in a battle for 1st and 2nd. The competition ended with England in 1st, Ireland 2nd, Scotland 3rd and Wales in 4th place. Compliments go to our Scottish hosts who made us all feel very welcomed and left no stone unturned with regards to the organisation. We look forward to the event’s development. A very big thank you to Ceri, Phil and all the staff at CSJ who accompanied the team on this trip. Thank you for your support, especially the sponsorship, which allows the Wales team to compete at these prestigious events.